Benchmark your sales and marketing programs, initiatives and budgets against others in the transportation, logistics, and supply chain industry. 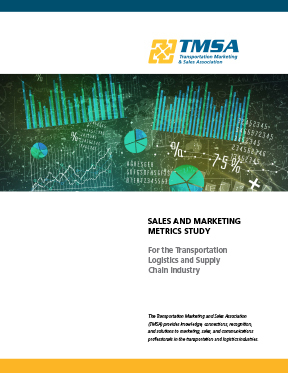 Initially launched in 2014, TMSA continues to conduct this metrics study every year. The goal of this ongoing research project is to help sales and marketing practitioners gain a better understanding of key sales and marketing metrics, how the metrics change over time, and best practices for marketing and sales success in the industry. Completing the survey should require no more than 15 minutes. To be efficient, be prepared to provide the metrics as outlined above. For completing the survey, TMSA will send you a complimentary copy of Executive Summary when it is published in April 2019. The complete set of metrics and analysis will be available ONLY to survey participants and TMSA members. Note that all survey responses are confidential and are reported only in aggregate form. Individual company data is NEVER shared with any other party. Please complete this survey by the Phase I deadline of May 10. If you have any questions about this critical research, contact Brian Everett, ABC, Chief Executive Officer of TMSA at 952-466-6270 x201.